Exhibition on Screen is dedicated to using the power of cinema to bring the stories of major exhibitions and artists to audiences worldwide. The organisation is in its fifth season, and its 19th feature film, Cézanne – Portraits of a Life, can be seen in cinemas from 23 January 2018. 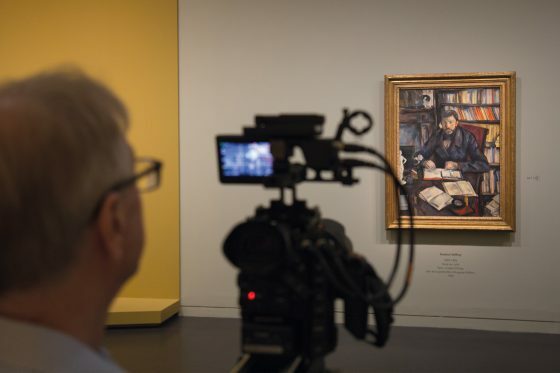 The film focuses on the life of Cézanne, drawing on the exhibition of the artist’s portraits currently on view at the National Portrait Gallery in London. We caught up with Phil Grabsky, the award-winning film maker behind the documentary. RRJ Editorial: What was it about Cézanne as an artist, and about the exhibition staged at the Musée D’Orsay, the National Portrait Gallery and the National Gallery of Art in Washington, that particularly attracted you to making this film? Phil Grabsky: Cézanne is the 19th Exhibition on Screen feature film that we’ve done, and about the 200th art film that I’ve worked on, including television films. Cézanne is really one of those artists who I’ve wanted the opportunity or excuse to have a really close look at. We had heard that the National Portrait Gallery was going to be doing this exhibition, and we thought it was the perfect opportunity. 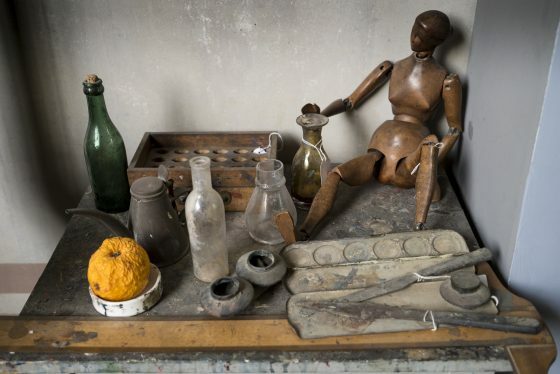 People know him for his landscapes and still lifes, so there’s something quite exciting about what is essentially the first ever exhibition dedicated to his portraits. Portraits are interesting in the sense that they obviously carry a lot of biography, which is nice for me as a film-maker because the films are generally as much biographies of the artist as they are reflections on the exhibition. I would also add that I think Cézanne is one of those artists who really stands up well in the cinema. Sometimes it’s easy, particularly in a gallery environment, or when you’re reading a book, to skim over his work. But it’s really valuable to stop and look at it closely, especially when you’ve got curators and art historians explaining what it is you’re looking at – there’s so much to it. RRJ: Cézanne – Portraits of a Life really gets to the heart of Cézanne as an individual, particularly in terms of his relationship with his family. Why did you decide to explore his personal life in this depth? PG: When I make a film about a classical composer like Beethoven, or an artist like Cézanne, my first point of call is the correspondence: letters, contemporary biographies, autobiographies. With Cézanne, so much about him is revealed when you read his letters. I’m like the audience – if I go to the gallery and someone says, “that’s a masterpiece”, that’s not enough for me. I’m endlessly curious. I want to know why it’s a masterpiece, what makes it a masterpiece, and then I want to know more about the social context, the historical context, why it was painted, and what was new about it. So I have all those questions, and the correspondence opens up quite a lot of answers. Cinema is also all about storytelling, and often with artists the best way of telling their story is through their biography. I think that’s certainly true of Cézanne. It’s easy to become overwhelmed by paintings, but by using the biographical story as a hook, everything makes a lot more sense. 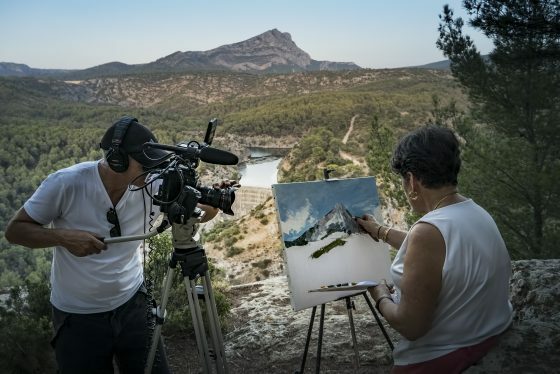 RRJ: The film presents some beautiful shots of Cézanne’s surroundings, from the countryside around Aix and the streets of Paris to his huge-windowed studio. Did you feel it was important to show elements from Cézanne’s everyday life alongside his paintings? PG: Yes, definitely. I had made a short biographical film about Cézanne before, so I knew some of these locations already, and they’re so evocative. The great thing to understand about Cézanne is that you have this duality, between the Parisian artist and the Provencal artist. And actually he was most at home and most comfortable in Aix-en-Provence. I think the landscape there is everything. It goes back to his childhood and younger years, where he would spend days with Emile Zola wandering through the woods. It permeates everything that he does, so it was important to reflect that in the film. You also learn a lot from those scenic shots. For example, looking at images of Aix, you realise that this was a bourgeois town, and that the artist was financially fortunate because he was the son of a wealthy man and didn’t have to worry about selling his paintings. Again, including these shots makes the film more cinematic. Audiences are very demanding: they don’t want a lecture when they go to the cinema, they want a film. We are ultimately dealing with two-dimensional objects and of course no one wants to go to the cinema and see a slideshow. So we want to make the film as cinematic as possible by using a variety of different cinematographic techniques. Another element of this was accompanying the film with a carefully commissioned score, to evoke the period and carry the film along with the cinematography. RRJ: How closely do you work with the curators of an exhibition when putting together a film like Cézanne – Portraits of a Life? PG: Very closely – the curators are our starting point. Once we’ve identified an exhibition and we’ve established whether we can work with it, I then want to know who the curators are and what their story is; what story are they intending to tell with the exhibition, and the thesis behind the exhibition. Then we have to decide to what extent we follow their narrative, or whether we bounce off theirs to tell an additional tale. It’s always a nice moment for us when we get away from some of the legal and technical hurdles, and start dealing with the curators, because they’re so enthusiastic. They’re passionate about what they do, and they’ve spent anywhere between three and 15 years on the show in question, and they usually love the fact that it’s going to be recorded for posterity. In this film we were very lucky because there were three curators we could talk to. They all had different areas of expertise and different things to say, and they were all happy to be filmed in front of the paintings, which was nice. The film is therefore full of insight, anecdote and detail. RRJ: Why do you think cinema works so well as a medium for making visual art more accessible? PG: It’s absolutely brilliant. I can honestly claim that just about everyone who comes to see one of our films absolutely loves it. There are a number of reasons. Firstly, when people watch things on TV, they are distracted by their phones, social media, making a cup of tea etc. But when people have made the commitment to go to the cinema, they’ve consciously or subconsciously told themselves that they’re going to sit there for 85 minutes and commit to the entire film. Furthermore, the quality of the screen these days is absolutely fantastic – it could hardly get any better, which is amazing both for me as a filmmaker and for the audience. We’re now in 60 countries, everything from 1500 seaters to 100 seaters, and in each of them the quality is going to be great. We never take the audience for granted, we don’t talk down to them and we treat them with intelligence. We tell a story that is easily to follow, making it accessible. What really excites me is that I get emails and Facebook messages from Venezuela, from Colombia, from Russia, from Iceland. There may be some politicians at the moment – naming no American presidents – who claim that there’s plenty that separates us. I think that art is something that unites us. People react very similarly to these films, no matter where they’re from, and I think that lies at the heart of what makes great art: it connects to us as humans in an emotional way, irrespective of our nationality, age, or demographic. Read more about Exhibition on Screen and Cézanne – Portraits of a Life here.